As a teenager in youth group way back in the day, I was encouraged by my youth pastor (shout out to Bro. Mo!) to do a daily devotional or have a personal quiet time with Jesus. During these precious moments, I was challenged to read a passage of Scripture, ponder on a short devotional thought found in my little devo book, spend a few minutes in silent prayer, and possibly journal what I learned from the Lord that day. I might spend 10 minutes, but no more than 30 tops. This is not the case for Millennials. Millennials prefer a much more tech-savvy devotional life. According to several presentations in my Religion in Life class which discussed how digital technology impacts the Christian faith, Millennial prefer to have their devotions texted to them on their cellphone. They rarely carry the bound-book version of the Bible, they prefer Bible apps on their phones. They like to get Bible verses texted to them throughout the day from friends and family. A little Jesus note from someone they love makes them feel better about their life and according to them, stronger in their personal faith. Silent prayer is probably not going to happen as they rarely unplug from their ear buds. They even admit they can’t stand the thought of prolonged silence. Music is required at all times, even if it is just walking from their car to class. Journaling is still out there, but only for women. Millennials believe they are constantly journaling by updating their Facebook statuses and sending out a deep-thought tweet. These shorter, public “journal entries” tell the ongoing story of their lives. Why is there any need to put something in a journal or diary when their are digital options. So here’s my question: Does this type of devotional life move young believers in Christ toward spiritual maturity or does it leave them lacking something deeper and more spiritually fulfilling. Eating a couple M&M’s through out the day will keep you from starving, but that menu is hardly nutritious or filling. Just a thought. The answer to your question is of course it leaves them lacking. 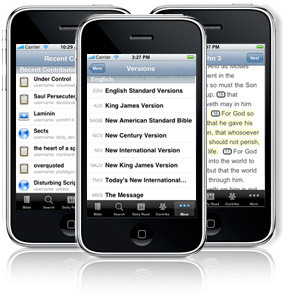 Having verses texted to you throughout the day cannot replace sitting down and actually studying scripture. Context alone demands that we look at what surrounds a particular verse to get a true meaning. That doesn’t mean that thoughtful texts from friends throughout the day doesn’t have a place, and can’t be meaningful, but they certainly cannot be used as a substitute to actually studying the Bible for yourself!! Your analogy is very good. It is like trying to sustain yourself with m&m’s when you should be consistently setting down to feed on the meat of the Word! If you consistently eat m&m’s you will eventually starve yourself spiritually.